All aspects new ORSupply.com will be available on desktop computers, tablets, and smartphones, including the redesigned, simplified checkout process. ORSupply.com — an online medical supplies and accessories division of DRE Medical — is pleased to announce the launch of its new, streamlined e-commerce platform. All aspects of the site will be available on desktop computers, tablets, and smartphones, including the redesigned, simplified checkout process. The new system makes purchasing supplies and scheduling reorders easier than ever by allowing customers to store and manage ordering history, shipping addresses and payment information — all in an encrypted and secure database. The new ORSupply.com is designed to allow customers a simple and secure way to browse the company’s selection of surgical instruments, cautery supplies, diagnostic equipment, and anesthesia supplies. 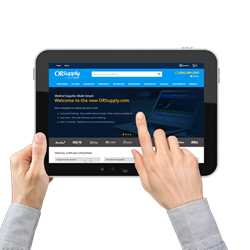 Explore the redesigned website today, and discover what ORSupply.com can offer your facility. ORSupply.com is a division of DRE Medical that specializes in selling and distributing medical accessories to hospitals, surgery centers, clinics, research labs and medical facilities across the United States. ORSupply.com’s goal is to provide medical professionals with a one-stop destination for researching and purchasing medical accessories and supplies.